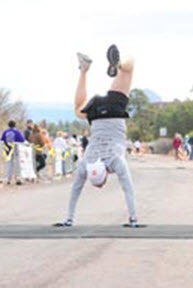 I have been running marathons now for just under 4 years. With ~40 under my belt I have recently decided to start moving to more ultra-marathons (technically any distance >26.2 miles), as a 26.2 mile run is now ‘easy’ for me. Well, ‘easy’ is a relative term. 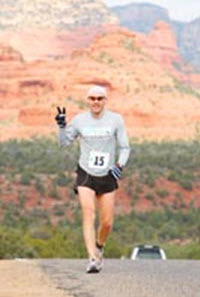 With my ability to recover from a hard 26.2 mile race in less than a few days, survive double marathon weekends, etc. I decided I needed to move up to longer and harder race distances. To think, when I was 18 years old, a 10K (6.2 miles!) was considered ‘too far’ for me. Having decided that I am going to run a 24 hour race in April and a 100 miler in July, I needed to do more long training runs. I thought I had a great idea. Go to a marathon, run 8 miles before the race, run the marathon, then run 6 miles as a cool-down afterwards, making it a 40 mile day. That is all well and good if you run the 40 miles at a smart pace. I screwed that plan up fierce. 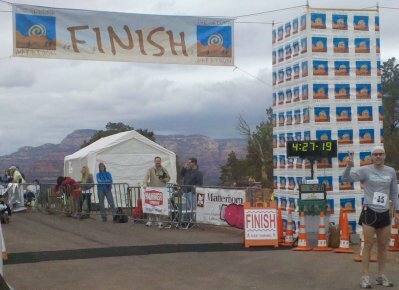 I woke up race morning in the tourist-trap-town that is Sedona, AZ at 4:20 am local time (which is 6:20 ET which is my normal wake-up time, no problem) did my standard morning thing (shower, tea, peanut butter sandwich) and went to the starting line about 80 minute before race time. I set out for my 8 mile warmup run, try to go easy. The pace started at about 8:00/mile and picked up, averaging 7:45 for the whole 8 miles. I get to the starting line about 10 min before start, warm and I am of course ready to go. I had not gotten ‘excited’ about this marathon race until just those last minutes, probably because I was so focused on the ‘40 mile day’. 5 miles at 7:10 pace. Just fine if I was running 26 miles, dumb if I am running 40. At about mile 11, I meet up with a nice guy from Pittsburgh. Turns out he is a post-doc Biology researcher at the University of Pittsburgh. We talked marathons and research for about 6 miles together which made those miles fly by. This was meant to be a ‘vacation’ marathon in that the scenery was one of the cool parts of this trip. 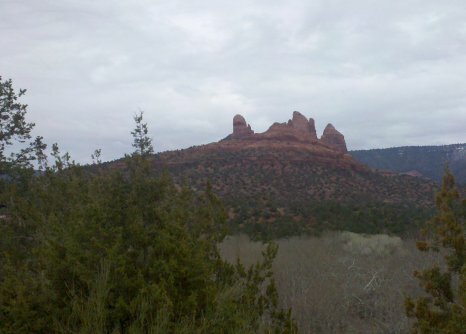 When I first rolled into Sedona, I was awe-struck, the burnt red buttes everywhere, snow covered mountains in the distance. It was beautiful and when I my mom called me I teased her for not bringing me here as a kid. By the second day in town, however, I realized that this place was almost identical to an area mere miles from Rock Springs, WY, the town I lived in 1998-2001, teaching at Western Wyoming Community College. I remembered how I missed being able to leave town and in short order be surrounded by beautiful wide open landscapes. After the race I changed clothes, got some food, and drove around town trying to take some good pictures. I had corresponded with a former student (from my days teaching in Wyoming) who lived in Prescott, 1.5 hours down the road towards Phoenix We decided to meet up for dinner and I had the time, so I took the scenic drive ‘over the pass’ which took me by Jerome, an old mining town literally built into the side of a mountain. It was cool, beautiful, but dangerous. I had to pull over a couple of times to enjoy the view because my eyes would linger a little too long while I was driving and I almost drove off the road to imminent death. Twice. I met up with my former student, Jon, who is now a successful Optometrist. It was really cool seeing someone who survived my class and actually went on to become what he wanted to ‘grow up to be’. He is married, has a little girl, doing what he loves and has the world by the horns. He knows what happiness really is and he went out and got it. It warmed the cockles of my heart to see him again. Since he was now an overpaid Doctor, I made him pay for dinner, of course. He was my student 8 years ago, seemingly a lifetime, but his memories of me (and mine of him) were still very vivid. It was quite nice. He still called me ‘Doc’ which made me giggle. A 2 hours drive back to Phoenix, a good nights sleep, and long flight back and my smash and grab tourist trip to beautiful Sedona was over. This was a both a learning experience trip as well as a time to remember times past, but just the good parts.